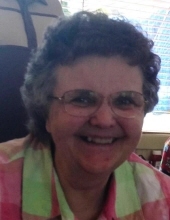 Linda Helen Williams, 71, of Sparta, WI, passed away peacefully at Rolling Hills Nursing Home in Sparta, WI; on Saturday, April 13, 2019. She was born in Sparta, WI, on May 30, 1947, to Leo and Elaine (Richards) Lambert. On November 12, 1966, Linda married her best friend, John Williams. Linda worked for 12 years at Mayo Health System, formerly St. Mary’s Hospital, in Sparta, as a switch board operator. She then went on to work as an operator in Tomah clinic for another 12 years before retiring and enjoying her role as a grandmother. Linda and John raised their children in Sparta and she was active in the community. She was also a life-long member of St. John’s Evangelical Church in Sparta. She was proud to say that she received all of her sacraments in the church where she was born and raised. Linda was an active member of Lutheran’s for Life, having spent many hours volunteering for the crisis pregnancy clinic. Linda is survived by her husband of 52 years; two sons, Michael Williams of Ettrick, WI, and Robert (Jessica) Williams of West Salem, WI; one grandson, Christopher Williams, along with many friends. Linda was preceded in death by her parents, Elaine and Leo Lambert. Funeral Services will be held Tuesday, April 16, 2019, 11:00 a.m. at St. John’s Evangelical Lutheran Church, Sparta, WI. Burial will follow in the church cemetery. Pastor John Meyer will officiate. Family and friends are invited for visitation at the church from 9:00 a.m. until the time of service. A special thanks to the caring staff at Rolling Hills for loving her like family and helping Linda’s family through this difficult time. Memorials may be given to St. John’s church and school in Linda’s memory. The Torkelson Page-Smith Funeral Home of Sparta is assisting the family with arrangements. "Email Address" would like to share the life celebration of Linda Helen Williams. Click on the "link" to go to share a favorite memory or leave a condolence message for the family.